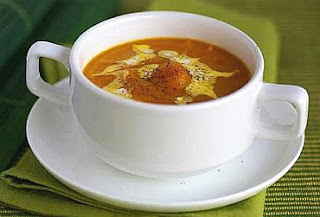 Malaysian's Food Taste: Pumpkin goodness - The pumpkin is a squash that's full of nutrition. THE pumpkin is an all-sea-son squash that is versatile and nutritious. It is a rich source of beta-carotene that can be converted into vitamin A. Pumpkin is a great way to boost your fibre intake. It is very tasty and can be cooked in several ways. 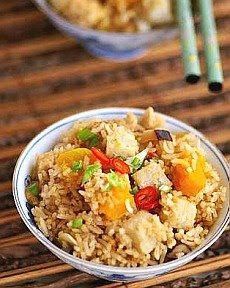 Try it in scones, cook it with rice or in a creamy soup. Deep-fry yam and pumpkin separately for 6-7 minutes. Dish out and set aside. briefly for 1-2 minutes. Stir in sea- soning to mix. Transfer rice mixture into an electric rice cooker. Pour in chicken stock and cook. Once rice comes to the boil, add yam and pumpkin and continue to cook until rice is done. Steam pumpkin and carrot for 15 minutes until soft. Leave to cool slightly then place into a food processor. Add 300-400ml chicken stock and blend into a smooth puree. Heat olive oil in a saucepan. Add bay leaf. Saute for a minute. Stir m pumpkin purOe and add remaining chicken stock gradually. Add cumin, nutmeg and chilli powder. Stir and bring to a gentle boil. Once the soup comes to a bubbling boil, add seasoning to taste and mm offthe heat. Ladle soup into individual bowls. Add an extra sprinkle of ground black pepper and stir in whipping cream if desired. Put sifted flour, sugar, salt and almonds into a mixing bowl. Rub in butter lightly using your fingers tips until mixture is crumbly. Add pumpkin paste and mix with a spatula, cutting through into the mixture until a sticky dough is formed. Turn dough out onto a lightly floured tabletop. Combine the dough quickly and lightly together until smooth. Roll out to a thickness of not less than 2cm and cut into rounds with a fluted or plain scone cutter. Gather up the excess dough and lightly press out. then cut out rounds again. Place scones on greased baking trays. Combine the milk and beaten egg and brush the top of the scones. Bake in preheated oven at 220C for 15 minutes or until well risen and golden. Split the scones and serve warm with butter or jam of your choice.